Historically, “anti-seep collars” made of a variety of materials (e.g. rubber, PVC, plastics, and even concrete) have been installed with the intention of serving as an impermeable barrier that encircles a pipe below grade. While these collars often do prevent wash-out, traditional installation using compacted soils can be time-consuming and technically problematic. AquaBlok® is superior in all aspects of traditional soil trench dams. Whether called a core trench, cut-off wall, or containment curtain, the goal remains essentially the same: to create a vertically-oriented hydraulic barrier to prevent the lateral movement of water. AquaBlok formulations are not subject to liquification and retain their essential properties under seismic loads. 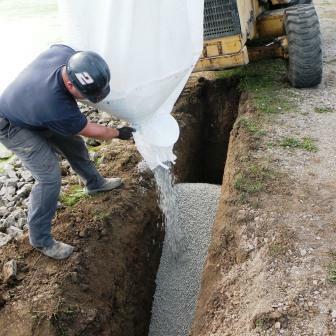 As a pre-blended, pour-in-place, self-compacting backfill, AquaBlok is structurally superior to traditional alternatives, and its simple installation saves money. Water directly against a building’s foundation is rarely a good thing, and no one likes a leaking basement. But, options to address excess roof runoff and/or poor drainage away from a foundation can be limited once initial construction is completed. AquaBlok placed into a shallow trench along the perimeter of a building or as a subsurface blanket around points of increased vulnerability (e.g. downspouts) can be a pennies on the dollar investment to prevent water damage. Many basins are excavated into inconsistent or marginal soils that are not ideally suited to hold surface water. If on-site substrates cannot be relied upon to hold water on their own, AquaBlok offers both full basin and spot treatments to help ensure proper function from the onset. Leaking pond? When on-site soils allow for water loss (seepage) to exceed water gain (input from precipitation/run-off), consistently low water levels result. AquaBlok offers two remedy options: (1) basin spot treatment to target isolated areas of vulnerability, and (2) full basin lining to reduce permeability over the majority of a waterway’s footprint. Cuts or tears in liner materials are a fact of life. Whether it is an incidental puncture from subsurface stone, damage from a rodent, deterioration from exposure to the sun’s ultraviolet light, or an intentional breach to install conduit for irrigation, spot-repair is a reality of the long-term maintenance of any synthetic liner material. AquaBlok is your trusted Band-Aid. Burrowing animals present an ongoing management challenge. Degradation to dikes, berms, and shorelines of valuable water resources from animals such as muskrats, nutria, groundhogs, and beaver can lead to leaks that may start small but worsen with time. Great for the do-it-yourselfer and equally valuable for the professional manager, AquaBlok offers a simpler fix. Any physical structure (e.g. stormwater overflow, catch basin, hydrant, etc.) installed to store or convey water is a source of vulnerability. Poor soils, inadequate compaction, erosional forces over time, or a combination of these factors can lead to failures, compromising the function of the structure and/or broader soil stability. AquaBlok is inexpensive insurance. Many stressors invite unwanted inflow to enter a sanitary system or other underground utility that conveys liquids that must be treated. Joints, stubs, and risers are particularly vulnerable to ground/surface water seepage. Deterioration from age and physical abuse (e.g. freeze/thaw, street traffic) only compounds the occurrences of costly leaks. AquaBlok, yet again, serves as a simple, pour-in-place exterior seal that is both flexible & durable. Just as with basins (e.g. ponds), moving bodies of water can experience water loss through bottom substrates, the side slopes, or both. This seepage becomes problematic, most often, when adjacent land use activities (e.g. mining) or seismic activity disturbs the geology of the underlying channel bed. The labor savings in reduced material handling along with the improved consistency of the seal can be significant in these installations. Whether in conjunction with another physical barrier (e.g. as a bedding beneath a “bladder dam”) or as a stand-alone quick-fix within a short-term earthen dam or diversion, this is a classic example of AquaBlok doing what its name suggests. Moving water will flow through the individual particles as they hydrate, but in a matter of hours a consistent seal will form. Removal/disposal is as simple as a well-placed excavator bucket. The word “AquaBlok” can’t mean more than it does when your home, facility, or entire community is threatened by rising flood waters. Used in conjunction with traditional protection (e.g. sandbags, gabions, etc. ), AquaBlok offers a consistently reliable seal at vulnerable transition points (e.g. between and beneath sandbag barrier walls), particularly when bracing to shield critical structures from water damage. AquaBlok placed into a three-dimensional cellular confinement system or geocell provides a classic example of multiple innovative products being utilized together to broaden the capabilities that each could offer individually. 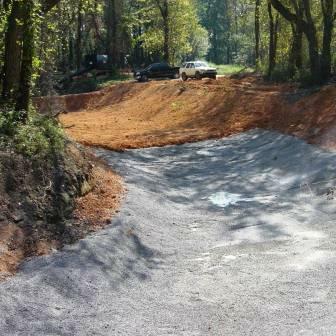 Most complementary on grades steeper than 3:1, this combination can be relevant on stream banks and shorelines or in any situation where surface water must be managed over severe topography (e.g. roadways, mining facilities, etc.). Because no two sinkholes are the same, no two sinkhole repairs are identical. That said, many surface depressions, whether caused by karst processes or general soil instability, benefit from a low-permeability sealant layer within the framework of a broader stability design. 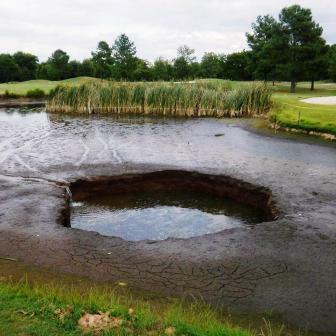 AquaBlok placed atop a newly re-established aggregate base can offer extra insurance to dramatically reduce the movement of water and help prevent the migration and re-occurrence of repeat sinkhole development. AquaBlok doesn’t just contain water. When applied below grade in a setting that will remain saturated, it also serves to fortify utilities that convey gases (e.g. methane collection systems on landfills). The structural support of the aggregate core coupled with the sealing capacity of the high quality sodium bentonite makes AquaBlok ideal both for bedding pipe and for reinforcing critical joints and junctions. As this page demonstrates, one of the unique attributes of AquaBlok is its versatility. Since its invention as a low-permeability sediment cap, engineers, contractors, professional facility managers, and even homeowners have found new ways to use the “natural material that doesn’t naturally occur in nature.” Let us know if you come up with a new application.